"Since its founding in 1928, Vouvray's Domaine Huët has been the standard-bearer for great, ageworthy Chenin Blanc. And to this day, year after year, the estate produces some of the world's most compelling white wines--and in a remarkable range that spans sparkling, dry, semi-dry, and breathtaking dessert styles. The domaine's founder, Victor Huët, was a Parisian bistro owner. However, with lungs and nerves shattered by his experiences in WWI, Victor re-settled to the town of Vouvray in France's beautiful Loire Valley. 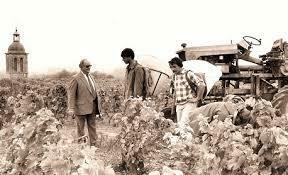 He soon purchased the first of his great vineyards, Le Haut-Lieu, in 1928, and Domaine Huët was born. Victor's son Gaston (born 1910) worked with his father from the beginning, and assumed full charge by 1937. With an obsessive devotion to quality, and an engaging showman's personality, Gaston built the Huët legacy over the next 55 years, despite spending five years in a German POW camp during WWII. The Grand Crus: For all his salesmanship, Gaston understood clearly that quality must come first--and that quality started with great vineyards. His Haut-Lieu parcel, which lies on Vouvray's "Première Côte" (or "first slope"), is home to virtually all of the appellation's acknowledged grand cru vineyards. As the estate prospered in the post-WWII era, Gaston secured two additional prime vineyards on the Première Côte that would ensure the domaine's stature: Le Mont (purchased in 1957) and Clos du Bourg (farmed since 1953, purchased in 1963). Collectively, these three vineyards, and the wines made from them, account for Huët being the greatest of all Vouvray producers. The Team: In 1971, Gaston was joined by his talented son-in-law, Noël Pinguet. Together, they crafted legendary wines from their three parcels--with the vineyards and nature dictating which grapes would become Sec, Demi- Sec, or Moelleux. The estate always held back significant stocks of older vintages, and these wines' near immortality has helped to further the Huët legend. In 2002, with Gaston ailing, a financial partner was needed to ensure the continuation of the estate's rich legacy. Anthony Hwang, a Filipino-born, New York businesmsman (and long-time sweet wine collector) was brought into the partnership. Gaston passed away that year, but, with the security and enthusiasm brought by Tony, Noël Pinguet was able to continue Gaston's important work up until his retirement in 2009. Today: With Huet veteran Jean-Bernard Berthomé at the helm, coupled with the endless support and passion of second generation siblings Sarah & Hugo Hwang, Domaine Huet may be making its most consistently great wines. As was one of the earliest adopters of biodynamic practices, and with years of experience working with the appellation's greatest terroirs, Jean-Bernard and his team are achieving a fascinating level of transparency, purity, and knife-edged balance in the wines. The Wines: As previously mentioned, at their discretion, the estate produces Sec, Demi-Sec, Moelleux, or Moelleux 1ère Trie ("first selection") from any of the three principal vineyards. A superb sparkling Pétillant is also made, drawing grapes from all three vineyards, as well as from other small parcels on the estate. Le Haut-Lieu--The original Huët vineyard is nearly 9 hectares. It has the richest soils of the domaine's three crus--a deep limestone-clay--and the wines are generally the estate's most approachable. In some vintages, small quantities from nearby estate parcels may be added to Le Haut-Lieu. Le Mont--For many insiders, the argument over Vouvray's greatest vineyard comes down to two sites: Le Mont and Clos du Bourg. Undisputably a grand cru vineyard, Le Mont enjoys a choice site on the Première Côte. With less clay and more stone than Le Haut-Lieu, including a high content of green mica, Le Mont yields young wines of intense minerality and often the most linear and precise wine in the Huet lineup. With age, the wines develop great length and finesse. Clos du Bourg--Gaston Huët believed this to be the greatest of all Vouvray vineyards. With the Première Côte's poorest, shallowest, stoniest soils, Clos du Bourg wines often produces the most powerful wine in the lineup, synthesizing Le Mont's intense minerality with Le Haut-Lieu's generous texture. Constance--Since 1989, the estate has also produced this magical, botrytized dessert wine selected from one, two or all three vineyards. Made only in great sweet wine vintages, the Cuvée Constance (named for Gaston's mother) ranks among the world's greatest dessert wines." Wine Spectator 96"Bright, even exuberant in feel, with a parade of Jonagold apple, green melon, Bosc pear and quince flavors streaming through, gilded with heather, honeysuckle and verbena notes on the long, lithe finish. Remarkably elegant despite the off-dry style. Drink now through 2035." Wine Spectator 97 "A stunner, with beautiful pear, green fig, yellow apple and quincenotes that are creamy and flirtatiously sweet, yet seamless and refined in feel. The extremely long finish lets honeysuckle and verbena notes dance throughout, with a light echo of white ginger at the very end.